In her later years, Baker fondly remembered a kiss she received at the age of three from Ulysses S. Grant at an annual charity ball given to raise funds for the HOME FOR THE FRIENDLESS, renamed MOUNT PLEASANT HOME. 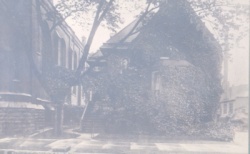 Martha Baker's home and property were willed to the church at the time of her death. Her residence was later demolished for the addition of an educational wing to the church.